Please remember this is a general schedule of the day so if you want to make sure to catch something, come early and stay late! Throughout the day there will be time for lei making, dance lessons, eating ono (delicious) treats and a raffle! 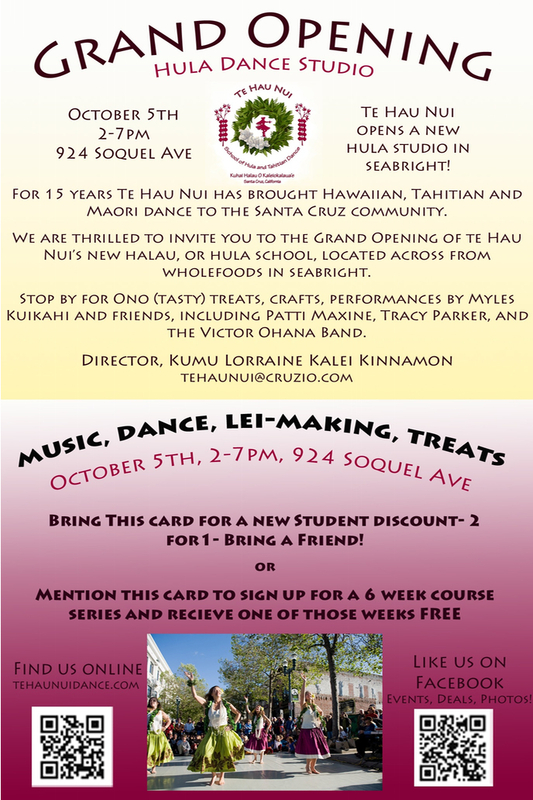 There will also be Te Hau Nui t-shirts and our 15 year anniversary DVD available for sale. 3:00-4:30 Hula auana (Hawaiian – modern style) and Maori dancing with dancers of Te Hau Nui and special guest Kahana Kuikahi. Music by the wonderful Myles Kuikahi, Patti Maxine, and Tracy Parker! 4:30- 6pm Tahitian dancing with dancers of Te Hau Nui and special guest Tuia Yuga and friends. Kahiko dancing. 5:30-7:00 Victor Ohana Band with dancers of Te Hau Nui.